The "184" is a delivery drone for humans. It's happened. Someone built a quadcopter big enough to carry human cargo. The future is officially here, and it's kinda scary. Scary in the cool way, though. The same company that brought us the regular-sized Ghost drone has just announced the "184" Personal Flying Vehicle (PFV). 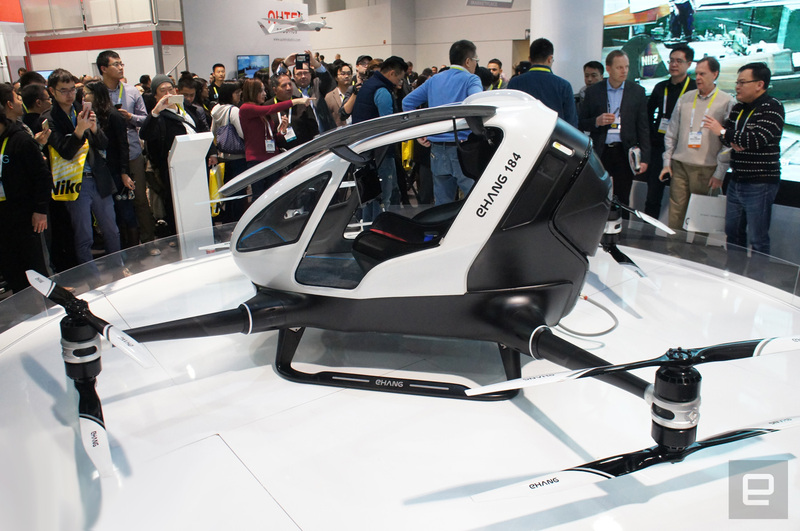 It's about the size of a (very) small car, and claims to be able to deliver one human (up to 260 pounds) anywhere within a 10 mile/23-minute flight time reach. A working prototype of the autonomous craft is being shown at CES, and we're pretty excited. If a little skeptical. The 184 doesn't just look like a drone; it acts like one. Passengers will only have minimal controls: take off, pause flight and land. The drone's autonomous flight controls do the rest. All you need to do is push a button -- that's if you can pry your white knuckles off the seat long enough to press them. Naturally, you have to tell it where you want to go (via a smartphone app, of course), but once you do, it'll fly you there automatically. To stop you getting uncomfortable while the quad delivers you to your destination, the 184 also comes with a few creature comforts. There's air conditioning, a 4G data connection, storage big enough for a backpack and even a (dual color) reading light. We assume for reading over your business presentation as you casually hover to work. NBD. We've seen other attempts at drone-like personal flying vehicles, but those usually are more of the homebrew variety (or the borderline insane). Ehang, for its part, seems to be deadly serious about the 184 (one person, eight propellers and four arms, if you were wondering). Not only has the company created the working prototype on display at CES today, but it plans to set-up a low-altitude flight command center to monitor all the 184s out in the wild. Something it hopes to do in the next few months. Ehang is also aware that a craft of this kind is something that aviation authorities are likely going to struggle to classify. The legalities of hobby drones are still evolving, and they likely won't cover something intended to ferry humans. The obvious question is, given the amount of hobby-size quadcopters unable to stay in the sky, how safe is the four-foot-tall 184? Ehang claims that there are full failsafe systems in place that would have the craft land should there be a problem, and system redundancy should mean that if something fails, you don't just fall out of the sky. Let's hope those systems work, because a top speed of 62mph, and max flight height of 11,000 feet mean you're going to want to have a lot of confidence in those safety mechanisms. We were shown an early video of the 184 flying, but it wasn't clear whether a human was on board, and perspective seemed off. It's also a bit suspicious that we were told it wasn't possible to see it working at the event in Vegas due to unspecified legal reasons (not even indoors or tethered). It all seems very mysterious, and we're not entirely sure it's possible, let alone advisable. Still, it's a cool idea none the less. Unsurprisingly, Ehang doesn't have a price for the 184, or a release date. But should it ever come to market, we expect it to be the preserve of (in this case literal) high flyers. Update: Ehang tells us that it estimates the price of the 184 will be around $200,000 to $300,000, and that it plans to make the drone commercially available sometime in 2016.